I don’t believe in too much garlic. I also don’t think too much cilantro is possible either. Marrying both of these flavors is always a win. I don’t post much seafood because people are intimated by preparing seafood but it will only get easier the more you work with it. Seafood is delicate and can get tricky to prepare but it’s just like meat and chicken when you get used to preparing it. This past weekend I hosted a private dinner for a lovely couple at Edie’s Eatery. One of the requests of the couple was to include lots of cilantro, garlic and peppers so we did just that. Garlic, cilantro and shrimp together is just a killer combo so it was plenty to work with. I used uncooked shrimp with the tails still on so I had to clean them up myself. They take a little longer to cook than shrimp that has already been cooked (obviously) so you’ll have to tweak the times accordingly. If you are using s bag of frozen shrimp, make sure to defrost completely before cooking in skillet. After you prepare your shrimp…. Heat your olive oil in a large skillet over medium high heat. Add your shrimp and cook 3-4 minutes. Add your garlic before the shrimp cooks fully. They will not be fully cooked until they are all pink but the garlic will burn if you cook it to early. Cook until the garlic becomes fragrant but not burnt. About 3-4 more minutes. Right when the shrimp are done cooking, remove from heat completely and add your cilantro. You don’t want to cook the cilantro you just want to add it for color and flavor. Toss everythjng together and skewer immediately or serve it as a side! 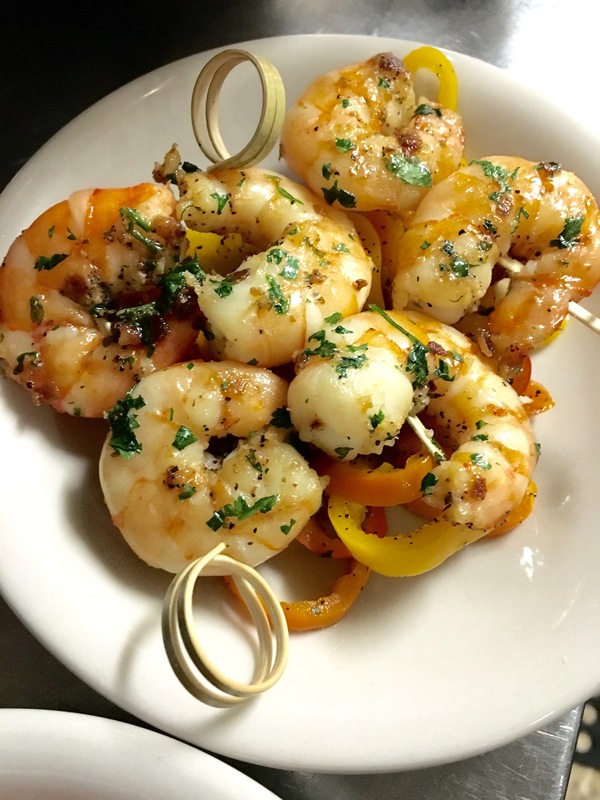 I put the shrimp on skewers because I was serving it at dinner but it makes a great side.